transform. The name carries no significance other than to improve the readability of str(transform) when DEBUG=True. If pass_through is True, all ancestors will always be invalidated, even if ‘self’ is already invalid. Return a copy of the Bbox, shifted to position c within a container. a string: - ‘C’ for centered - ‘S’ for bottom-center - ‘SE’ for bottom-left - ‘E’ for left - etc. Optional argument container is the box within which the Bbox is positioned; it defaults to the initial Bbox. (property) Returns (x0, y0, width, height). Returns True if (x, y) is a coordinate inside the bounding box or on its edge. Returns True if x is between or equal to x0 and x1. Returns True if y is between or equal to y0 and y1. Return an array of points which are the four corners of this rectangle. For example, if this Bbox is defined by the points (a, b) and (c, d), corners() returns (a, b), (a, d), (c, b) and (c, d). Count the number of vertices contained in the Bbox. vertices is a Nx2 Numpy array. Return a new Bbox which is this Bbox expanded around its center by the given factors sw and sh. (property) Returns (x0, y0, x1, y1). Returns True if (x, y) is a coordinate inside the bounding box, but not on its edge. Returns True if x is between but not equal to x0 and x1. Returns True if y is between but not equal to y0 and y1. Returns True if this bounding box overlaps with the given bounding box other, but not on its edge alone. (property) The height of the bounding box. It may be negative if y1 < y0. (property) intervalx is the pair of x coordinates that define the bounding box. It is not guaranteed to be sorted from left to right. (property) intervaly is the pair of y coordinates that define the bounding box. It is not guaranteed to be sorted from bottom to top. Return a new Bbox object, statically transformed by the inverse of the given transform. Returns True if the Bbox is the unit bounding box from (0, 0) to (1, 1). (property) max is the top-right corner of the bounding box. (property) min is the bottom-left corner of the bounding box. Returns True if this bounding box overlaps with the given bounding box other. (property) p0 is the first pair of (x, y) coordinates that define the bounding box. It is not guaranteed to be the bottom-left corner. For that, use min. (property) p1 is the second pair of (x, y) coordinates that define the bounding box. It is not guaranteed to be the top-right corner. For that, use max. Return a new Bbox that is padded on all four sides by the given value. Return a copy of the Bbox, shrunk so that it is as large as it can be while having the desired aspect ratio, box_aspect. If the box coordinates are relative—that is, fractions of a larger box such as a figure—then the physical aspect ratio of that figure is specified with fig_aspect, so that box_aspect can also be given as a ratio of the absolute dimensions, not the relative dimensions. (property) The width and height of the bounding box. May be negative, in the same way as width and height. 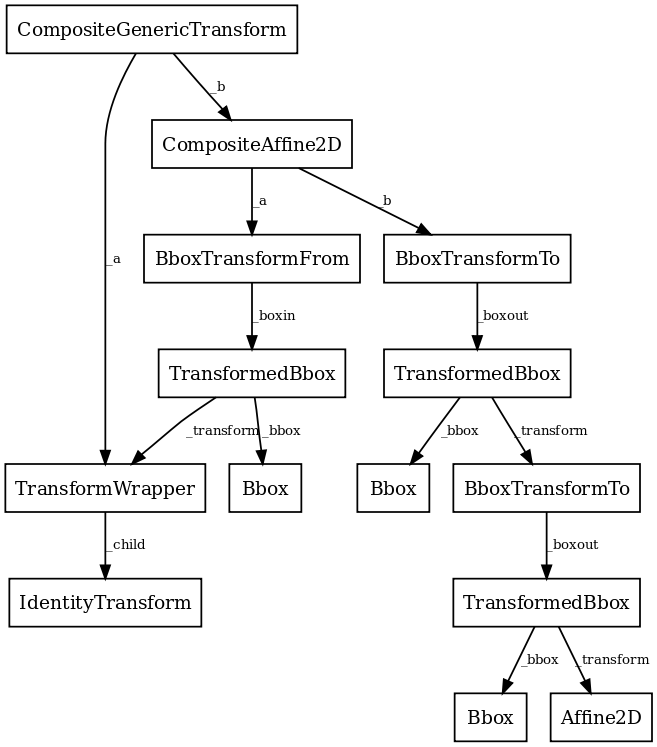 Return a new Bbox object, statically transformed by the given transform. Return a copy of the Bbox, statically translated by tx and ty. (property) The width of the bounding box. It may be negative if x1 < x0. (property) x0 is the first of the pair of x coordinates that define the bounding box. x0 is not guaranteed to be less than x1. If you require that, use xmin. (property) x1 is the second of the pair of x coordinates that define the bounding box. x1 is not guaranteed to be greater than x0. If you require that, use xmax. (property) xmax is the right edge of the bounding box. (property) xmin is the left edge of the bounding box. (property) y0 is the first of the pair of y coordinates that define the bounding box. y0 is not guaranteed to be less than y1. If you require that, use ymin. (property) y1 is the second of the pair of y coordinates that define the bounding box. y1 is not guaranteed to be greater than y0. If you require that, use ymax. (property) ymax is the top edge of the bounding box. (property) ymin is the bottom edge of the bounding box. (staticmethod) Create a new Bbox from x0, y0, width and height. (staticmethod) Create a new Bbox from left, bottom, right and top. Set whether the existing bounds of the box should be ignored by subsequent calls to update_from_data() or update_from_data_xy(). When True, subsequent calls to update_from_data() will ignore the existing bounds of the Bbox. When False, subsequent calls to update_from_data() will include the existing bounds of the Bbox. Set this bounding box from the “frozen” bounds of another Bbox. (staticmethod) Create a new unit Bbox from (0, 0) to (1, 1). Returns whether the given branch is a sub-tree of this transform on each seperate dimension. Performs transformation on a set of angles anchored at specific locations. The angles must be a column vector (i.e., numpy array). The pts must be a two-column numpy array of x,y positions (angle transforms currently only work in 2D). This array must have the same number of rows as angles. radians (True) or degrees (False; the default). determining transformed angles (see discussion of method below). The transformed angles are returned in an array with the same size as angles. The generic version of this method uses a very generic algorithm that transforms pts, as well as locations very close to pts, to find the angle in the transformed system. (staticmethod) Return a new Affine2D object that is the identity transform. A special class that does on thing, the identity transform, in a fast way. A “blended” transform uses one transform for the x-direction, and another transform for the y-direction. This “generic” version can handle any given child transform in the x- and y-directions. Create a new “blended” transform using x_transform to transform the x-axis and y_transform to transform the y-axis. You will generally not call this constructor directly but use the blended_transform_factory() function instead, which can determine automatically which kind of blended transform to create. This “generic” version can handle any two arbitrary transformations. You will generally not call this constructor directly but use the composite_transform_factory() function instead, which can automatically choose the best kind of composite transform instance to create. BboxTransform linearly transforms points from one Bbox to another Bbox. A transformation that translates by xt and yt, after xt and yt have been transformad by the given transform scale_trans. Paths are considered immutable by this class. Any update to the path’s vertices/codes will not trigger a transform recomputation. Create a new TransformedPath from the given Path and Transform. Returns vmin, vmax, expanded and/or swapped if necessary. If either input is inf or NaN, or if both inputs are 0, returns -expander, expander.